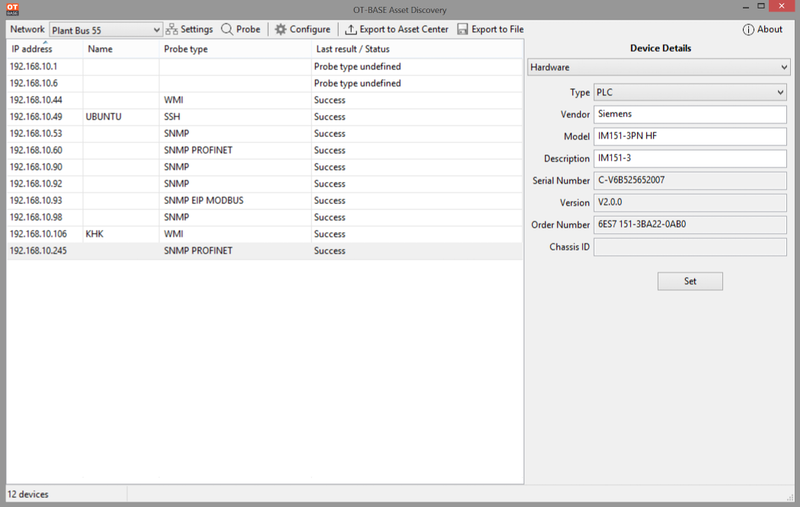 Start your OT/ICS asset discovery within an hour. No SPAN ports, no network appliances, no solution architects required. On this page you can download the evaluation version of OT-BASE Asset Discovery if you are an OT asset owner. OT-BASE Asset Discovery is the part of the OT-BASE asset management platform that automatically discovers the identity and configuration of your computers, network switches, PLCs, operator stations, RTUs, etc. The OT-BASE Asset Discovery evaluation software runs on Windows 7 and higher, and stops working 90 days after installation. Note that you can also use OT-BASE Asset Discovery to probe IT networks. If you are interested in a full OT-BASE evaluation, including the OT-BASE Asset Center software, contact us for details. By downloading the evaluation software you accept the OT-BASE license terms. IMPORTANT: Don’t use a fake name, Gmail address etc., or you won’t get the download link. Response emails will only be sent to corporate email addresses / real identities of OT asset owners. Allow a business day for processing.